Lestin Wilshire had a game high 27 points and 18 rebounds and Phillip Glasgow followed up with 19 points, 13 boards and dished out seven assists, as the Starz ended Next’s six game winning streak, 82-75, early Sunday morning, assuring that no team will go through the Hon. Julian Fraser Save the Seed Basketball League unbeaten. James led Next with 20 points. Raheem Blyden add 15 with 11 rebounds, Kevis Phillips followed up with 13 points and pulled 10 off the glass while Eustace Freeman dropped in 12 points and pulled 15 off the rack. Next coach Morris Wattley was missing leading scorer Killven Samuel which affected his strategy and said they were short handed. Defending champions West Gunners kept Community One winless, following a 108-72 victory. 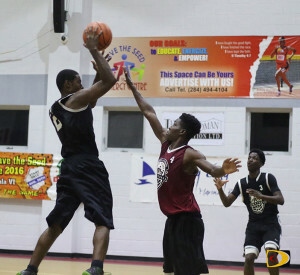 Douron Phillips had a game high 27 points and 15 rebounds for his double double to lead West Gunners scorers. Ray Victor narrowly missed a triple double with his 23 points, 13 rebounds and nine assists. Nicols Charles poured in another 22 to the tally, while Rowan Victor finished with a 19 points and 10 rebounds double double. He also has seven assists and seven steals. Rudy Vanterpool led Community One with 26 points and 15 rebounds. Vaughn Bassue narrowly missed a double double with 20 points and nine rebounds. Warrias used 34 points from Juan Hatchett in beating Red Zone, 88-65. Delbert Samuel followed up with 12 points and snatched 20 off the glass. Joylon Wilson had Red Zone’s top score with 19 points. Deshawn Matthew and Nat Malone added 15 points respectively. Friday and Saturday’s game have been rescheduled and play will resume in the league on Sunday.